The Justice Department Demands Justice For Children With Special Needs, and Their Families. In fact what’s going on in Florida is so atrocious that the United States Justice Department is stepping in. In a letter to the State of Florida, U.S. Assistant Attorney General, Thomas E. Perez, outlines the results of a federal investigation which shows how the State is in violation of the Americans with Disabilities Act. I’ve embedded the full letter below so you can read in its entirety if you’d like. (Warning, it’s heartbreaking, and will no doubt make you angry.) If you don’t want to read through the 22 page letter, feel free to scroll to the bottom of this post where I’ve outlined some of the most telling parts of the letter. I’ve made the embed code embeddable, so if you’re a blogger, and would like to include the letter on your site, you’re free to do so, simply copy and paste. Be sure to let me know if you have any problems reading it, or embedding it. So what’s the State of Florida doing that’s so wrong, and just how are they violating the civil rights of hundreds of children living with special needs? The Americans With Disabilities Act Changed Everything. In case you weren’t aware, there was in time in this country where children like my son (who wasborn with Down syndrome) were basically forced to be raised in a mental institution! Can you even imagine a small baby (regardless of if they were born with a disability or not) being stripped away from his mommy and daddy and forced to live in a mental institution? It causes tears to steam down my face just thinking about. But it really happened. Right here in the United States of America. These children received little (or no) early childhood intervention, little (or no) formal education, and no real love and support. They were cared for by people punching a clock. Their job was to simply make sure that these children ate a few times a day, and remained medicated enough so that all they could do is just lay in bed. These children did not receive proper medical care, did not get a chance to build and develop meaningful relationships, and did not get the opportunity to live in a loving and supportive home which is so vital to a child’s success. It was a tragedy then. And it’s a tragedy now. I believe this is the reason you don’t see to many older people with Down syndrome out and about today. Don’t get me wrong, I’ve received a few emails from families who went against the State 40-50 years ago and refused to allow their child to be institutionalized; instead choosing to raise their child in their own home. I have the utmost respect for those families because I can’t even imagine how difficult that must have been for them. They had none of the support and resources that we have today, yet their children grew up to live rewarding, meaningful, and fulfilling lives. My hats go off to those families. All of that to say that because of the Americans with Disability Act, today is (supposedly) a different day in the United States for people living with disabilities. 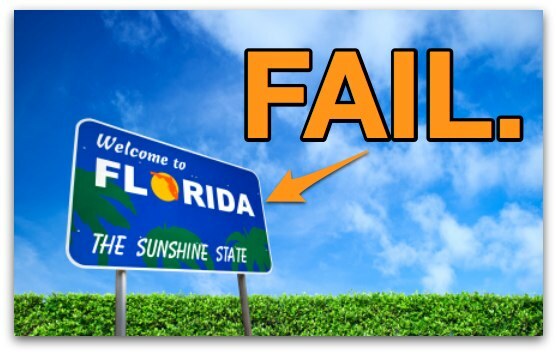 The State Of Florida Apparently Didn’t Get the Memo. The U.S. Justice Department launched an investigation and found that the State of Florida to have violated the Americans With Disabilities Act. I encourage you read the U.S. Assistant Attorney General’s letter I embedded above to get all the details, but if you don’t feel like reading through the letter, I took the time to do it for you. To be honest, I can’t believe the things that I read in the Justice Department’s letter are actually happening in The United States in 2012! A father of son with special needsIt’s insulting, hurtful, and offensive. My heart breaks for the mommies, daddies, and children who can’t be together as a family because the State of Florida is violating Federal law. I’m thankful that the Federal Government has gotten involved and has brought these injustices to light. My prayer is that the U.S. Justice Department follows through on this letter, and sees to it that the state of Florida responds swiftly to their requests to “remedy the deficiencies”outlined in their letter. I’m also thankful that I don’t live in the State of Florida. What are your thoughts about what’s going on in Florida? Also if you have any personal experience with Florida’s mis-treatment of children with disabilities and their families, I’d love to hear your story. Please leve a comment below with your thoughts, and your stories. You can keep your child at home. You don’t have to give your child to the state.